Fernandez de Corres et al 1993  reported 3 patients with generalized urticaria and/or angioedema; 3 with rhinitis and/or asthma; 1 with anaphylaxis and 2 with mouth itching. Rodriguez et al 1993  reported 2 cases of anaphylaxis after eating chestnuts. Añibarro et al 1993  reported one patient with urticaria and dry cough. Blanco et al 1994  reported 4 patients with systemic anaphylaxis; 4 with angioedema; 1 with rhinoconjunctivitis and 1 with urticaria. Blanco et al 1994  reported 3 patients with systemic anaphylaxis; 4 with angioedema and 1 with asthma. Antico 1996  reported one patient with oral allergy syndrome. Beezhold et al 1996  reported one patient with anaphylaxis. Diaz-Perales et al 2002  reported 8 patients with 4 oral allergy symdrome, 1 angioedema, 1 urticaria and 2 anaphylaxis with chestnut. Garcia-Selles et al. 2002  reported 10/47 peach allergic patients showed symptoms to chestnut with 4 oral allergy symdrome, 3 urticaria and angioedema and 3 anaphylaxis. PBS extract of raw chestnut (Fernandez de Corres et al 1993 ). Fresh chestnut (Rodriguez et al 1993 ). A chestnut extract; preparation not described (Añibarro et al 1993 ). 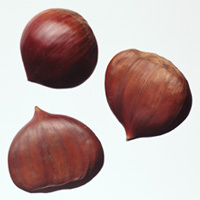 Fresh chestnuts (Blanco et al 1994 ; Blanco et al 1994 ; Antico 1996 ). Dilution 1/10 of a commercial extract (Miles Inc., Elkhart, USA) (Beezhold et al 1996 ). PBS extract from peeled chestnut; a chitinase-enriched protein preparation and the purified Cas s 5 allergen (Blanco et al 1999 ). Prick-prick with chestnut (Diaz-Perales et al 2002 ). Diaz-Perales et al (2002)  and Crespo et al. (2002)  defined as positive a mean wheal diameter which was 3 mm larger than the saline control after 15 minutes. 8 latex allergic patients (Fernandez de Corres et al 1993 ) . 3 latex allergic patients with positive SPT (Rodriguez et al 1993 ). 1 patient with latex sensitization (Añibarro et al 1993 ). 25 patients with latex allergy (Blanco et al 1994 ). 17 patients with immediate avocado hypersensitivity (Blanco et al 1994 ). 1 patient with oral allergy syndrome induced by chestnuts (Antico, 1996 ). 47 latex allergic patients (Beezhold et al 1996 ). 18 patients with latex-fruit allergy (Blanco et al 1999 ). 8 latex allergic patients with a history of symptoms to chestnut, avocado or banana (Diaz-Perales et al 2002 ). 6/8 latex allergic patients showed positive SPT to chestnut (Fernandez de Corres et al 1993 ) . Three latex allergic patients gave positive SPT with chestnut (Rodriguez et al 1993 ). One patient showed positive SPT to latex and chestnut (Añibarro et al 1993 ). 9/25 patients with latex allergy showed chestnut hypersensitivity with positive SPT (Blanco et al 1994 ). 10/17 patients with immediate avocado hypersensitivity showed positive SPT to chestnut and 8/17 of these had clinical manifestations (Blanco et al 1994 ). A patient with oral allergy syndrome induced by chestnuts had a negative SPT to chestnut (Antico, 1996 ). 13/47 latex allergic patients gave positive SPT to chestnut (Beezhold et al 1996 ). The purified allergen Cas s 5 (called Cas s 1 in the article) elicited positive SPT in 13 of 18 (72%) patients with latex-fruit allergy. By contrast its class II chitinase equivalent did not show positive SPT responses (Blanco et al 1999 ). 11/47 (23%) of peach allergics and 3/20 (15%) of Artimisia pollen allergic patients gave positive SPT to chestnut (Garcia-Selles et al. 2002 ). Positive SPT to chestnut only occurred in patients with a positive SPT to Artemisia. Mean wheal diameters of 6-9mm for the 8 patients (Diaz-Perales et al 2002 ). Diaz-Perales et al. (1998)  and Blanco et al. (1999)  made a crude extract by grounding mature nuts in a mortar with cold acetone and then defatting three times with the same solvent (1:5 w/v) for 1 hour at 4° C. The dried residues was extracted with 0.1 M sodium phosphate buffer (pH 7.0) in 0.15 M NaCl (1:5 w/v) for 1 hour at 4° C. The supernatant was centrifuged, dialyzed against water and freeze-dried. Commercial extracts were used in the CAP assay by Crespo et al. (2002) . Brehler et al (1997)  used sera from 136 patients with immediate hypersensitivity to latex. Diaz-Perales et al. (1998)  used sera from 4 patients (testing 20) with immediate hypersensitivity to chestnut and avocado according to the clinical history, positive skin prick test responses with the corresponding food extract and specific IgE levels to chestnut or avocado higher than 3.5 kU/L. Blanco et al. (1999)  used sera from 18 patients (selected from 60) with immediate hypersensitivity to chestnut and avocado according to the clinical history and positive skin prick test responses with the corresponding food extract. Diaz-Perales et al (1999)  used sera from 8 patients with immediate hypersensitivity to banana, chestnut, and/or avocado, according to the clinical history, positive skin prick test responses with the corresponding food extracts and specific IgE levels higher than 3.5 kU/L to at least 2 of the 3 foods. As control, sera was used from 5 patients with latex allergy but without accompanying food allergy. Diaz-Perales et al (2002)  used sera from 8 latex allergic patients with a history of symptoms to chestnut, avocado or banana, together with 8 atopic controls (several patients are common between the above studies). Diaz-Perales et al (2000)  used a pool of six sera from patients allergic to apple and peach. Crespo et al. (2002)  tested sera from 65 fruit allergic patients. Brehler et al (1997)  found specific IgE antibodies against chestnut allergens in 47/136 patient's sera. Blanco et al. (1999)  found that IgE from sera of 10/18 patients bound to chestnut extract (0.4-23.6 kU/l). This was lower than for latex and slightly lower than avocado where 16/18 sera were CAP positive. Diaz-Perales et al (2002)  found IgE of 1.1-23.6 kU/l for chestnut (higher for latex). The sera was used to investigate the recombinant allergen Cas s 5. Crespo et al. (2002)  reported that 22/65 patients gave either a positive SPT or CAP-RAST test to chestnut. Diaz-Perales et al. (1998) , Blanco et al. (1999) , Diaz-Perales et al (1999)  and Diaz-Perales et al (2002)  used 1D SDS-PAGE (15% polyacrylamide) without treating the samples with heating or reducing agents. Diaz-Perales et al. (2000)  separated samples by 1D SDS-PAGE on aSDS-PAGE was carried out on 4% to 20% precast polyacrylamide gels (Bio-Rad) without treating the samples with heating or reducing agents. Diaz-Perales et al. (1998) , Blanco et al. (1999) , Diaz-Perales et al (1999)  and Diaz-Perales et al (2002)  soaked the gels for 15 minutes in buffer and electrotransferrred to PVDF membranes for 60 minutes at 80V. Membranes were washed, blocked and incubated with sera (1:3 dilution), then alkaline phosphatase conjugated monoclonal anti-human IgE was added. Allergens were revealed with 5-bromo-4-chloro-3-indolyl phosphate/nitroblue tetrazolium. Diaz-Perales et al. (2000)  electrotransferred proteins onto nitrocellulose membranes. After blocking with 5% w/v BSA in phosphate buffered saline, PBS, for 2 hours at room temperature, the blots were incubated overnight with each individual serum (1:10 dilution in 0.5% BSA, 0.05% v/v Tween-20 in PBS). After washing 4 times with 0.1% v/v Tween-20 in PBS, membranes were overlaid with mouse anti-human IgE mAb HE-2 ascitic fluid (1:3000 dilution) for 2 hours and then washed and incubated with a rabbit anti-mouse IgE peroxidase-conjugated antibody (DAKO A/S, Denmark) for 1 hour. Detection of IgE-binding components was achieved by enhanced chemiluminescence. Diaz-Perales et al. (1998)  reported that a single band of 32 kDa was recognized in both chestnut and avocado extracts by IgE from either a pool of the four sera or each individual serum. Purified purified chestnut and avocado class I chitinases which were also recognized and the class II chitinases were not. Preincubation with the purified class I chitinases could fully inhibit binding of IgE from the pooled sera to chestnut extracts. The N-terminal sequences of the class I chitinases were determined. Blanco et al. (1999)  found that IgE from pooled sera of patients bound to a single band of 32 kDa in both the crude chestnut and avocado extracts. This band coincided with one from the purified chestnut and avocado class I chitinases which were also recognized, although the class II chitinases were not. Diaz-Perales et al (1999)  found that sera from patients with latex allergy alone did not recognise allergens in chestnut extracts. Sera from patients with latex/fruit allergy recognised allergens from chestnut, cherimoya, passion fruit, kiwi, latex, papaya, mango, potato, tomato and wheat. All except the potato band were also recognised by anti-class I chitinase IgG. Diaz-Perales et al (2002)  found bands at 31 kDa with both native and recombinant Cas s 5 which could be inhibited by the Cas s 5 preparations or by latex hevein, Hev b 6. Diaz-Perales et al. (2000)  reported that the serum pool reactive to apple and peach LTPs, also contains specific IgE to the expected low molecular weight bands of the mugwort and chestnut extracts, as well as to the corresponding isolated LTPs. The chestnut polypeptide shows an even stronger reaction than the apple and peach allergens. Food used and oral provocation vehicle:The food was masked in a mix of orange and pineapple juice, sugar, wheat meal and liquid colouring (Crespo et al. 2002 ). Number of Patients:Crespo et al. (2002)  challenged 18 patients with chestnut who had either a positive SPT or CAP-RAST positive sera. Symptoms:Crespo et al. (2002)  report 2/18 positive challenges with chestnut but no symptoms were described. 4 additional patients with a convincing history of anaphylaxis were not challenged. Cas s 5 allergic patients are generally sensitized to latex and will cross-react with other class I chitinases in the fruits of the latex-fruit syndrome such as Avocado, banana etc. Diaz-Perales et al (1999)  have established IgE cross-reactivity between avocado, chestnut, cherimoya, passion fruit, kiwi, latex, papaya, mango, potato, tomato and wheat as purified avocado Prs a 1 inhibits binding to the other extracts by immunoblotting. Cas s 8 allergic patients may be sensitized via Artimisia pollen and IgE may cross-react with nsLTP in peach. The extent of IgE cross-reactivity has been analysed by García Sellés et al. (2002)  and by Crespo et al. (2002)  who recommend that DBPCFC should be used to test the real extent of cross reactions. Although the Bet v 1 homologue, Cas s 1 is a significant pollen allergen (Kos et al. 1993 ; Mari et al. 2003 ), it has not been demonstrated as a food allergen. Diaz-Perales A, Sanchez-Monge R, Blanco C, Lombardero M, Carillo T, Salcedo G.
What is the role of the hevein-like domain of fruit class I chitinases in their allergenic capacity? Añibarro B., Garcia-Ara M.C. and Pascual C.
Associated sensitization to latex and chestnut. Hypersensitivity to latex , chestnut , and banana. Sensitization from chestnuts and bananas in patients with urticaria and anaphylasis from contact with latex. Kos T., Hoffmann-Sommergruber K., Ferreira F., Hirschwehr R., Ahorn H., Horak F., Jager S., Sperr W., Kraft D., Scheiner O.
Purification, characterization and N-terminal amino acid sequence of a new major allergen from European chestnut pollen--Cas s 1. Hirschwehr R, Jager S, Horak F, Ferreira F, Valenta R, Ebner C, Kraft D, Scheiner O. Allergens from birch pollen and pollen of the European chestnut share common epitopes. Oral allergy syndrome induced by chestnut (Castanea sativa). Mari A, Wallner M, Ferreira F.
Fagales pollen sensitization in a birch-free area: a respiratory cohort survey using Fagales pollen extracts and birch recombinant allergens (rBet v 1, rBet v 2, rBet v 4). Process, chemical, enzymatic:Most allergens of the Bet v 1 family are thermolabile allergens. Nature of main cross-reacting proteins:Cas s 1 is a member of the Bet v 1 family. IgE binding to Cas s 1 could be completely inhibited by pre-incubating sera with purified recombinant Bet v I (Hirschwehr et al. 1993 ). Allergen properties & biological function:Cas s 1 is a member of the PR10 family with a possible defence function against plant pathogens. Allergen purification:Purified from an aqueous extract of chestnut pollen by affinity chromatography using an immobilized anti-Bet v 1 antibody (BIP1), eluting with 0.1 M glycine/HCl at pH 2.5, followed by anion-exchange chromatography using a DEAE column (DEAE-5WP, TOSO-HAAS, Japan) equilibrated with 20 mM Tris/HCl at pH 8.3. Elution used a gradient of 0-0.5 M NaCl. Kos et al. (1993)  report the N-terminal sequence GVFTHESQETSVIPPARLFKAFVL. Protein Family:Two domains, chitin binding - PF00187 and chitinase I - PF00182. Allergen epitopes:Diaz-Perales et al (2002)  show that specific IgE bound only to recombinant Cas s 5 and not to the recombinant catalytic domain. Sánchez-Monge et al (2000)  show that green bean class I chitinase is denatured by boiling and does not bind anti-hevein IgE. Diaz-Perales et al (2003)  show that the avocado allergen (Prs a 1) is rapidly degraded by pepsin but that the fragments retain IgE binding potency. These results may suggest that Cas s 5 would be destroyed by boiling but might survive digestion. Nature of main cross-reacting proteins:There are cross reactions with other class I plant endochitinases of fruits like banana, avocado and kiwi fruit. It is a panallergen involved in the fruit-latex syndrome. Allergen properties & biological function:Cas s 5 is a class I endochitinase with a possible defence function against plant pathogens. Collada et al (1992)  purified basic endochitinases from Castanea sativa cotyledons and Allona et al. (1996)  expressed a chitinase (Cas s 5) in a bacterial system. Diaz-Perales et al (1998)  started from a PBS extract of chestnut which was salted-out with 80% saturated (NH4)2SO4. The pellets were collected by centrifugation, dissolved in PBS buffer, and then the pH was brought to 3.5 by addition of 0.1 mol/L HCl. After centrifugation, the supernatants were dialyzed against distilled H2O and freeze-dried. 30 mg of protein was dissolved in 20 mmol/L Tris-HCl (pH 8.0) and loaded onto a column (45 × 2.5 cm) of regenerated chitin, which was equilibrated with the same buffer. Elution was carried out with 300 ml (3 hours) of 20 mmol/L sodium acetate (pH 5.5) followed by 400 ml (4 hours) of 20 mmol/L acetic acid (pH 3.2) and chitinases containing fractions were pooled, concentrated, and desalted. These were subjected to cation-exchange chromatography with a Mono S HR 5/5 column (Pharmacia). The column was equilibrated with 10 mmol/L sodium acetate (pH 5.3) (buffer A), and eluted with a salt gradient to 0.5 mol/L NaCl in the same acetate buffer (buffer B). The two-step linear gradient was 0% to 50% of buffer B in 40 minutes and 50% to 100% of buffer B in 20 minutes (1 ml/min). SDS-PAGE and immunodetection was used. Diaz-Perales et al (2002)  expressed both recombinant Cas s 5 and Cas s 5 with its hevein domain deleted in Pichia. These were purified by gel filtration on Superdex 75 and cation exchange on Mono-S (both columns from Amersham Pharmacia) to give single bands on SDS-Page (Coomassie Blue stained) at the calculated masses. Other biochemical information:Both a Bet v 1 homologue and a class I endochitinase have been called Cas s 1 in the literature. The class I endochitinase was renamed as Cas s 5. Moneo I., LLamazares A., Curiel G. and Martinez J. Characterization of latex and chestnut antigens by immunoblotting. Allona I., Collada C., Casado R., Paz-Ares J. and Aragoncillo C.
Bacterial expression of an active class Ib chitinase from Castanea sativa cotyledons. Collada C., Casado R., Fraile A. and Aragoncillo C.
Basic endochitinases are major proteins in Castanea sativa cotyledons. Process, chemical, enzymatic:Cas s 8 is a non-specific LTP and these are generally thermostable. Nature of main cross-reacting proteins:There is IgE cross-reactivity with other nsLTPs especially that from peach. None of the patients studied by García Sellés et al. (2002)  were SPT positive to chestnut only and only 5/47 were positive for a single food (all peach). 10/47 patients were SPT positive to peach, apple, Artemisa and chestnut which was the second largest group. Allergen properties & biological function:Cas s 8 is a non-specific lipid transfer protein (ns LTP). There is an expandable cavity between the four alpha-helices which can bind one or two lipids. nsLTPs have also been reported to act as plant defense proteins against bacterial and fungal infections and form the PR14 family of pathogenesis related proteins. Allergen purification:Chestnut LTP was isolated by Diaz-Perales et al. (2000)  from ground hulled chestnuts, which were defatted with acetone (1:5 w/v; 1 h; 4 °C), and then with ethanol:ether (1:3 v/v; 1 h; 4 °C). The dried material was then extracted with PBS buffer (0.1 M sodium phosphate, pH 7.0, 0.15 M NaCl; 1:5 w/v; 1 h; 4 °C). The extract was gel-filtrated on a Sephacryl S200 column (2.5 X 85 cm; Pharmacia Biotech, Uppsala, Sweden), using 0.1m ammonium acetate as elution buffer (1mL/min). Fractions enriched in chestnut LTP were pooled, freeze-dried, and then separated by RP-HPLC on a preparative Vydac-C4 column (22 X 250 mm; particle size 10 µm), eluting with a three-step linear gradient of acetonitrile in 0.1% trifluoroacetic acid (10% during 45 min; 10% to 35% in 140 min; 35% to 50% in 100 min and 50% to 85% in 15 min; 1 mL/min). Other biochemical information:Diaz-Perales et al. (2000)  report the 36 amino acid N-terminal sequence SITCTQVSKSLMPCLTYLKSNGGSPPPGTCCQGVKL.